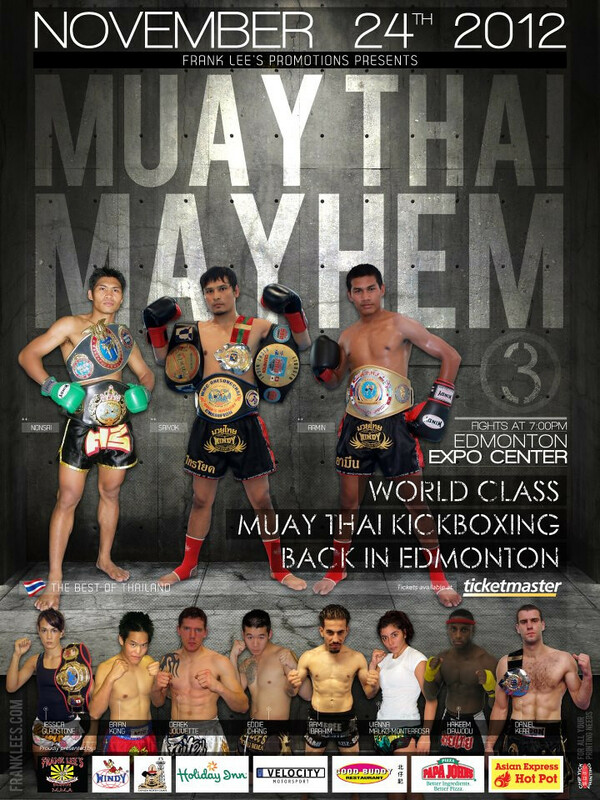 Muay Thai Mayhem 3 opened on the November 24th night and the results are in. Much thanks Frank Lee’s gym in Edmonton, Canada for the near real time updates. By all feedback I’ve gotten from people that were there it was an awesome event that lived up to everything it promised. Hopefully a streamed pay per view product will be lined up for Muay Thai Mayhem 4. Will Quijada defeats Daniel Kechego by Unanimous Decision. Vienna Malko-Monterossa defeats Alyssa Goodridge by KO at 1:03 in Round 2. Derek Jolivette defeats Kingsley Opoku by Unanimous Decision. Eddy Chang defeats Oli McKiernanand and wins the CMTC Amateur 140lb Title by unanimous decision. Hakeem Dawodu defeats Rungjaras by KO at 1:59 of Round 2. Lindsay Ball defeats Nong-Nan by unanimous decision. Nonsai Sor Sanyakorn defeats Daniel Kerr by unanimous decision. Armin Matli defeats Stephane Celeste by unanimous decision. Saiyok Pumpanmuang defeats Wilfried Montagne by unanimous decision. ~ by fatsoking on November 26, 2012.